Fabric Piggy Bank. Original Pig piggy bank shaped fabric as he targets coins, growing pig. So you know, feed him!! Coins, coins that's what he likes. This is a typical pig piggy bank but something more common to our times. 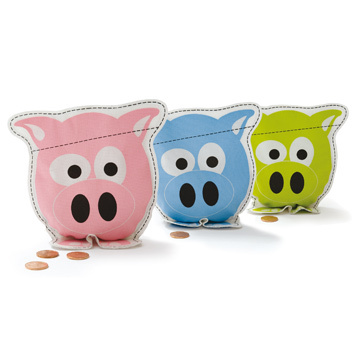 Pig Money Box fabric that grows the more coins you feed. When you think it's time to open the bank, just cut by the dotted line. Available in various colors, pink, blue and green.